There are some things in your life that just seem like simple coincidence. Like when you and the guy in line in front of you at the grocery store are buying the same toothpaste. Then there are other events that (if you believe in this sort of thing) feel too amazing, too important, just too miraculous to be coincidence. They must be tiny little miracles. Take for instance the miracle that happened this week for our family. First a little back story--about 6 years ago a woman in China made a decision not to have an abortion, gave birth to a baby girl and for a reason we will probably never know, left her at an orphanage. Her name became Liang Xiao Chang. Within just a couple of weeks another baby girl arrived at the orphanage. For 9 months, she and Chang slept in the same room, played with the same toys, probably wore the same clothes. They were cared for by the same woman. They were living like sisters. Then one day some American families came and took these girls back to the United States. Their families stayed in touch and grew closer over the years. In fact, both families also brought home children from Congo (how about that for a crazy coincidence), but they lived far enough away from each other that they only got to meet about once a year. Until this week, when a miracle brought our dear friends and Grace's China sister to live just 15 minutes from our house. How's that for miraculous! Two girls born days apart in a tiny village in China, thousands of miles from Texas are now together again. Wow! Brian and I have been married for 24 years. The night we met I was trying to hook up with one of his fraternity brothers, but Brian made me laugh and the rest is history. I have now been married to Brian longer than I wasn't married to him. Brian and I had the amazing opportunity to work for several years together at the same school as theatre teachers. During those years God placed a boy named Cody into our program. He taught us how to be parents. Early in our marriage we had pretty much decided never to have children. Then on a trip home from my grandmother's funeral God whispered in our both our ears that we were supposed to have children. Somewhere between California and Texas we decided to begin an international adoption. After we adopted Grace we started to research other countries and one day the OFA website just showed up on my computer and led us to Haven. Haven survived war, malnutrition, malaria, and the death of his birth mother to become a member of our family. We almost didn't accept JoJo's referral. He looked like he had a dent in his head and we didn't know if we were really equipped to be the parents of a kid with a dented head. We took a leap of faith and as it turns out he wasn't dented. Manny and JoJo both survived malaria. Katriel and Louise both survived malaria. This next miracle has a sad side. In January of last year we lost a little girl that we had named Lisette. She did not survive malaria. She was already very sick when she arrived at the foster home and she only lived a few days. However, she did not die alone in an orphanage. 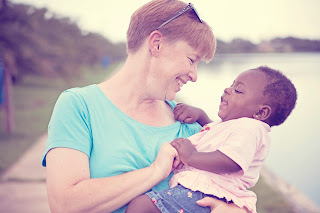 She died in the arms of a loving foster family in Congo, showered by prayers from her family here in the United States. She was given a proper funeral and she is missed. But her passing brought another miracle. Within a few days, we were matched with Louise. Her birth mother had just died. Now I don't know if I can explain it, but Louise is so so so much my daughter. She called me Mama after just one day in Congo. She gets my sense of humor. She hugs and kisses me with such intensity. She is part of my heart in a different way. I love all of my kids, but Louise simply could not have been anyone else's daughter. We were meant to be together. Every night we pray at the dinner table and right after I ask God to please stop the kids from throwing their food on the floor, keep Haven from spilling his drink, and keep me from losing my temper, I thank God for the amazing miracles that are sitting around the table with me. You might not be a miracle person, but you must admit that my life has been filled with some pretty amazing coincidences!